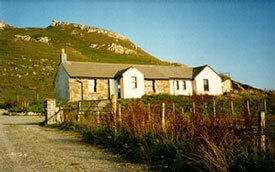 The Elphin Caving Centre (ECC) is a renovated and extended building in Elphin 24 km north of Ullapool. It has self-catering accomodation for 20 people, gas and wood fires, toilets, hot showers, gas rings for cooking, a microwave oven, parking for eight cars et cetera. It also has the best location of any caving hut in the entire country with a superb view of Cul Mor, Suilven and Canisp from the front door - three mountains of 849, 731 and 846 metres respectively. The ECC is to the right (east) of the main road just after the telephone box on the left when you are travelling north through Elphin. Cost is 8 pounds per night.